Vertical flow immunoassays rely on the same basic principles as the more common lateral flow immunoassay format with some modifications. The most apparent difference between the two methods being the vertical and lateral flow of fluid. However, vertical flow technology has several advantages over traditional lateral flow assays with the most significant being the reduced assay time (<5 minutes), table I.
Vertical flow immunoassays can be used for rapid detection of an antigen(s) in a sample of interest. 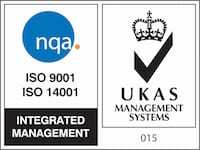 Samples can come from a wide range of application areas such as clinical, veterinary, agricultural, food, bio-defence and environmental industries. Detection sensitivity is generally in the lower nanogram per ml range even in complex sample matrices. Table I. 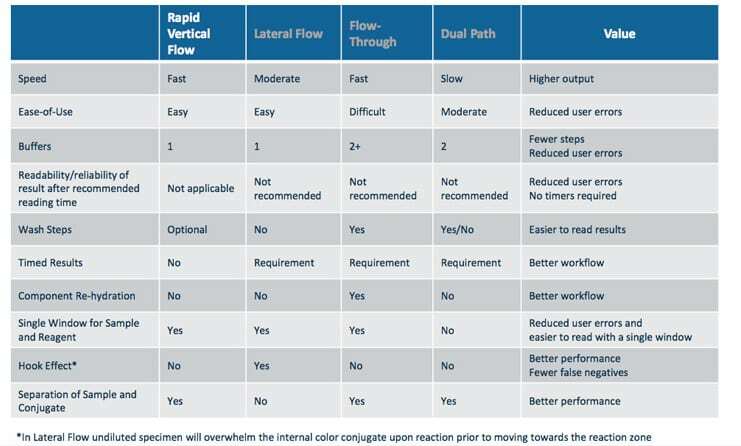 Features and benefit of rapid vertical flow technology compared to lateral flow and other rapid flow type tests. As with lateral flow, vertical flow immunoassays rely on the immobilization of a capture antibody on a reagent pad to which the sample of interest (with or without antigen to be detected) is applied. Detection of the bound antigen is subsequently achieved through the binding of an antigen specific antibody gold conjugate. 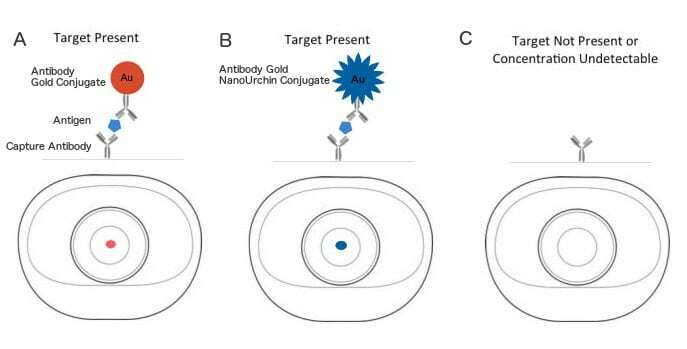 This step completes a sandwich consisting of a capture antibody, an antigen and finally the gold conjugate and results in a direct and permanent visually detectable red coloured dot indicating the presence of the antigen, figure 1. Of interest is that alternative colour of detection can easily be achieved by using a different type of nanoparticle conjugate probe for detection. One example being antibody conjugated gold nanourchins, which will yield a blue coloured dot upon positive detection in the assay. Figure 1. Illustration of the appearance of the Miriad™ vertical flow cartridge after applying a gold conjugate (A) or a gold nanourchin conjugate (B) when target is present (A, B) and not present (C) in the sample analyzed. Vertical flow technology also allows for easy multiplexing. In the Miriad™ vertical flow test cartridges distributed by Cytodiagnostics Inc., the presence of 4 targets can be evaluated simultaneously in a single sample in 5 minutes or less. Multiplexing is easily achieved by spotting capture antibodies against different antigens at pre-determined locations and/or patterns on the membrane. For easier visualization this multiplexing can also be coupled with nanoparticle probes of different colours, e.g. using a gold conjugate and a gold nanourchin conjugate with red and blue detection colours, respectively. Figure 2. Multiplex detection in a vertical flow immunoassay. Left image shows positive detection of 2 out of 3 antigens (red dots) and the control. The right image shows positive detection of two different antigens using two nanoparticle probes with different colours (red: gold nanoparticles, blue: gold nanourchins.